It's so good to get out for a little adventure in your own backyard isn't it. One of the many things I love about where we live is its proximity to the harbour and the city. This afternoon the kids left school at lunch time for a little history in action on our harbour. 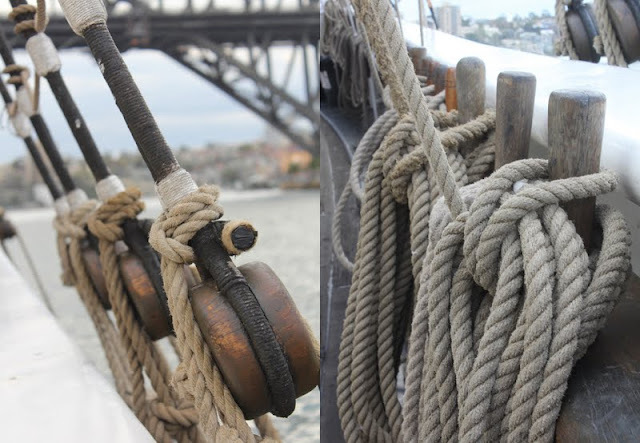 Thanks to some cheap tickets via one of those deal emails, we set sail on Sydney harbour on a historic Tall Ship. History coming alive for my kids as well as a beautiful afternoon on the harbour taking in Sydney's beautiful shoreline. The sunshine made a spotlight over the harbour bridge. I have to say though I think the kids preferred the ferry trip home. Aren't kids funny like that. Although the afternoon was very still on the harbour today and there was not much speed in our sails on the tall ship (just lots of people drinking champagne) so the fast ferry home probably was more fun. thanks Fiona for inspiring me to get out and about in Sydney more. Your photos are so beautiful as are your kids. what cuties they are. Your afternoon adventure looks lots of fun. I hope you all have a lovely easter. I am glad to see you haven't gone too far from your blog. I would miss you too much. Happy Easter. these are some beautiful photos of the harbour. Beautiful children, beautiful photos, beautiful harbour.